Countdown To The 2019 Top-8 Camp! The “Top-8/Prospects” camp is an invitation only weeklong program designed specifically for the highly committed top athlete. The camp will be limited to only 8 students. Camp registration is through personal invitation only to ensure that everyone in the camp is at a point in their career where they are willing and committed to taking their game to the next level. Each day will consist of three on-ice training sessions. The first session is reserved just for goaltender specific movement. The second session will be comprised of drill concepts where the goaltender will be exposed to high repetitions of shots. 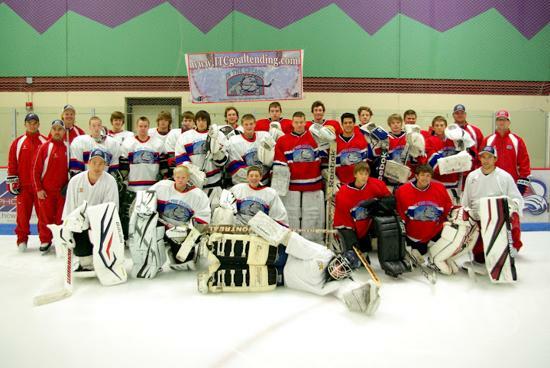 The third session will be full-ice 4-on-4 games providing goalies the opportunity to perform in a game situation. While not on the ice, goaltenders will be run through a rigorous and educational high altitude off-ice development-training program. This program is designed specifically for the hockey goaltender and will encompass all training aspects necessary for competing at a high level. Each student will also be tested on their off-ice strengths and be given results to be able to compare themselves against other goaltenders of their level. Every drill of each on-ice session is evaluated by our staff and compiled so that at the end of the week each goaltender will receive a personalized evaluation covering the entire week pinpointing areas of improvement through out the week and what areas the goaltender still needs to continue developing. The cost of the camp includes 20 hours of on-ice training, 20 hours of off-ice development, 5 hours of classroom time/activities, lunch each day, an NHL quality game jersey, workout shorts, t-shirt, and hat.